Our new custom rancher-style home for sale is ready for occupancy. Located in Courtenay, BC, this 2,010 sq. ft. home is designed in a transitional style and includes 3 bedrooms and 3 bathrooms. You will experience a feeling of west coast elegance when you walk in the front door and see the ocean view from the large windows in the great room. The indoor/outdoor see-through fireplace is a “wow factor” in this home as it unites the space between the great room and the outdoor deck. Imagine being on the outside covered deck, listening to your playlist on the surround sound Bluetooth speakers and enjoying the ocean views over Comox Bay with your family and friends! The large deck, finished with glass panels is steps away from the great room, kitchen and dining room. The great room is adjacent to the open concept kitchen which features two-tone custom cabinets, finished in cloud white and ebony. This modern colour selection goes perfectly with the large island, quartz countertops, marble backsplash and high-end lighting fixtures. The wide-plank engineered hardwood flooring in white oak combined with the contemporary colour palette completes the elegant, clean look in the kitchen, dining room and great room. The master bedroom has a luxurious ensuite with double sinks, a heated floor and a large walk-in rain shower featuring double shower heads and Bluetooth surround sound. A concrete pad has been poured outside of the master suite to accommodate a hot tub. The large garage has parking for two cars with lots of additional parking for guests in the driveway. The garage in this home includes roughed-in electrical wiring for an electric or hybrid car. The yard is fully landscaped and fenced, and comes with an underground automated irrigation system. This home has been custom designed by Coastal Custom Homes and it is a “must see” if you are looking to purchase a new home. There are many extra features and upgrades included in this home. This is Vancouver Island living at its very best! Experience the casual elegance of this home, and enjoy the ocean and mountain views! Coastal Custom Homes will soon begin construction on a new home at The Ridge in Courtenay, B.C. This floor plan, designed with versatility in mind, features 1,457 sq. ft. and has two bedrooms, a den/office space and two bathrooms. The extra bedroom can be adapted to be used as a media room or for a hobby or exercise area. Designed in a transitional style, this open concept floor plan features a modern kitchen with two-tone, dark stain shaker cabinets, a large island with white quartz countertops with a seating area, modern lighting and a large pantry. White oak engineered flooring runs throughout the kitchen, dining room and living room. The stunning see-through gas fireplace is located in the living room and is the focal point of this main area and of the master bedroom. The laundry room is accessible from both the garage and kitchen and features built-in cabinets, a sink and a large closet, perfect for hanging up coats when you arrive home. One of the highlights of this beautiful rancher is the master bedroom area which features a spacious walk-in closet and spa-like ensuite which includes a soaker bathtub, a separate tiled shower, double sinks and heated tile floors. While in your master bedroom, you can cozy up to the other side of the see-through gas fireplace. One fireplace, two rooms of enjoyment, the master bedroom and living room! The large garage has parking for two cars, with lots of additional parking for guests in the driveway. This home will also include roughed in electrical wiring for an electric or hybrid car in the garage. The exterior features timber and stone accents, a covered entrance and large windows. The yard will be fully landscaped and will include underground sprinklers. This home is scheduled to be completed in September 2019. If you want to move in sooner, we have a stunning 2,010 sq. ft., three-bathroom, three-bedroom home that will be ready for occupancy in April of 2019. This home features an indoor-outdoor fireplace, large outside deck and spectacular views of Comox Bay and the mainland mountains. Our mission at Coastal Custom Homes is to build a quality home for you and your family to enjoy for many years to come. Planning makes all of the difference when it comes to building your custom dream home and we are here to help you through the planning, designing and construction stages of your new home. We have built homes for families who need more floor space, for clients downsizing and for clients who wish to relocate. We listen to our clients and to what they want in their new home and we design the layout, based on their wish list and their budget. We continue to have a collaborative conversation with our clients through the process of building their new home. We will help you make educated and informed decisions about various choices available to you regarding inside and outside materials. 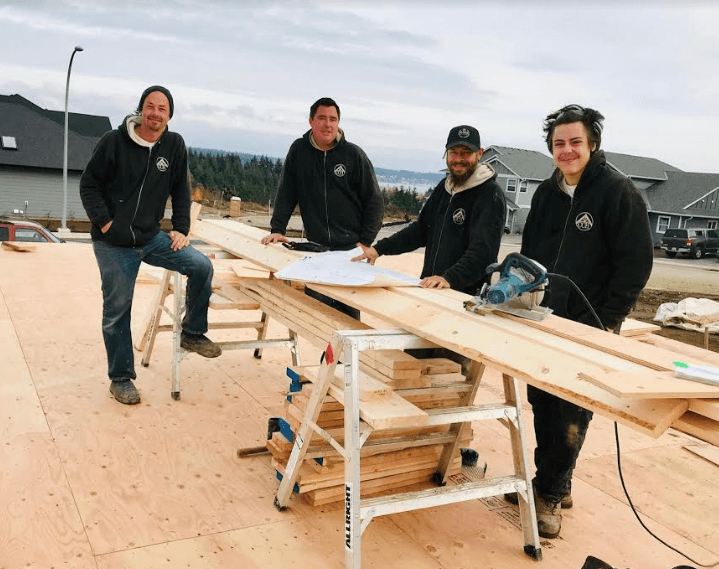 Our team at Coastal Custom Homes is dedicated to helping you through one of the biggest projects of your life and we strive to make this an exciting and happy process for you. The result is exceptional homes and happy homeowners. At Coastal Custom Homes we design original homes, using our “in-house” interior designer and we provide the owner with a comfortable, functional and energy efficient home that is beautiful inside and out. We have the passion, expertise and the dedicated team to build your home on schedule and on budget. “Dean and his crew are amazing. Totally professional, honest, reliable and hard working. Dean is always there to listen and take care of any issues. He definitely over-delivers on his promises. He is generous with his time and energy. When Dean says the Coastal Custom Homes team will do something, he will make sure it gets done – and done right. We would absolutely use them again and also recommend them to anyone that wants a first class job done on their construction project. If you have the opportunity to work with Coastal Custom Homes, go for it! 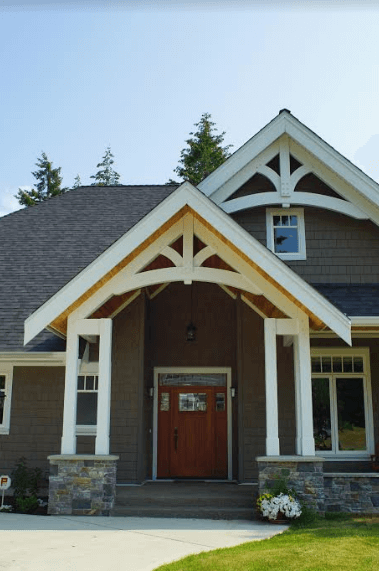 For more information on building a new custom home in Courtenay or the Comox Valley, BC on Vancouver Island, contact us, we would love to hear from you. This open concept, 2,010 sq. 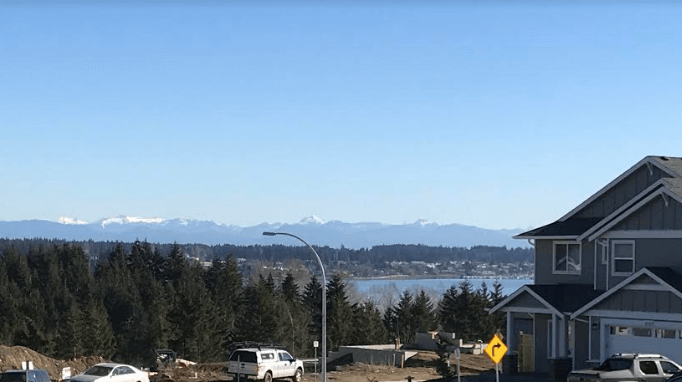 ft. home for sale in Courtenay, BC features spectacular views of the Comox Bay and the surrounding mountains. Built in a rancher/bungalow style this spacious home offers 3 bedrooms, 2.5 baths and has additional space for a separate office, exercise room or den. This home has large windows and the kitchen, dining room, living room and master bedroom. Currently, under construction, this beautiful home will be ready for occupancy in February of 2019. Enjoy cozying up to a see-through indoor/outdoor fireplace located in the living room. You can also enjoy the fireplace as you gather under the outside covered patio. This unique fireplace is a perfect feature where you can enjoy some quiet time, entertain or spend time with your family. Enjoy spectacular mountain and ocean views from the living room and outdoor patio. This home was custom designed by Coastal Custom Homes and has many additional distinctive features including: a custom kitchen with quartz countertops and high end lighting and finishes, a 12 foot high ceiling in the foyer and living room, a large 10’ by 8.5’ laundry/mud room which is located next to the garage and features built-in cabinets and a two car garage with additional parking in the driveway for guests. Located in the new housing development, The Ridge in south Courtenay on Vancouver Island, this friendly community is quiet and situated only minutes from shopping, restaurants, the new hospital, the Comox Airport, golf courses, many beaches, Mt. Washington and other amenities. Our team of professional carpenters and sub-trades are hard at work to have this home ready for occupancy in March of 2019. It is located at 4166 Chancellor Crescent in Courtenay, B.C. This home is listed for sale on the MLS system, #447063. Come and see the design for this new rancher style home, with an open concept and views of ocean and of the Beaufort Mountains. This 3 bedroom, 2.5 bathroom home, along with a separate office or den gives you 2,010 sq. ft. of generous space to walk effortlessly from one room to the other. Wake up every morning to the sun rise over Comox Bay and enjoy the view from the living room, dining room, kitchen or master bedroom. Situated in the new housing development, The Ridge, this friendly community is close to everything in Courtenay yet tucked away on the outskirts of the city so that you can enjoy the tranquility of the neighbourhood. It is only minutes away from the beach! Do you enjoy sitting around a warm fire? Or cozying up to a fireplace? 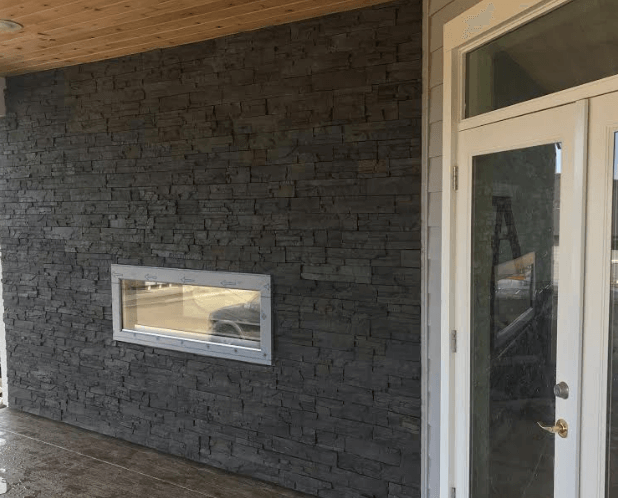 This custom home features an indoor/outdoor fireplace so that you and your family can enjoy the see through fireplace from the inside of the home or the outdoor deck. Perfect for entertaining or enjoying the outside mountain and ocean views. The design of this new home features a spacious foyer which opens up to the custom kitchen and dining room.The ceiling in the foyer and great room is 12 feet high. The large 10.5’ by 8’ laundry/mud room is located next to the garage and features built in cabinets. The attached garage has space for two cars and the driveway can accommodate two additional cars. Invite your friends and family over to visit you in this beautiful new home in Courtenay on Vancouver Island. New Custom Home Rancher/Bungalow Completed | Ready for Occupancy! We are pleased to announce that our 1,620 sq. 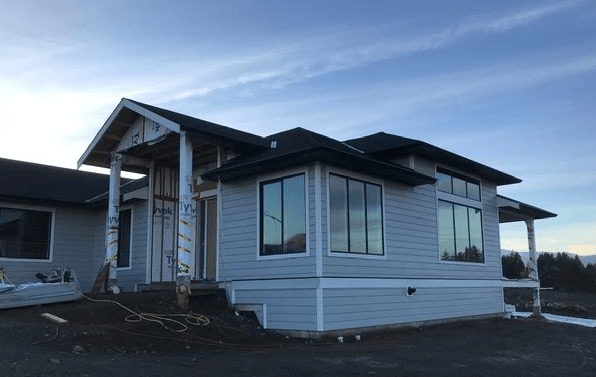 ft. rancher located at The Ridge in the Comox Valley has been built and is ready for immediate occupancy. This beautifully finished home features 9 foot ceilings, large windows, a bright and sunny kitchen, custom built kitchen cabinets with quartz countertops, elegant lighting in the kitchen and an open concept great room. It also has a beautiful floor to ceiling custom built marble tile gas fireplace in the great room which features stunning panoramic views of Comox Bay and the mainland mountains. The master bathroom includes heated tile flooring, custom lighting, quartz countertops, a soaker bathtub and a large walk in tiled shower. The master bedroom also features ocean views and has a walk in closet with built in cabinets. This three bedroom, two bathroom home also has a large laundry room, located adjacent to the kitchen with built in cabinets, perfect for storing away your cleaning items. A rear covered deck is accessible from the great room and the master bedroom. Imagine watching the sunrise over the mountains and Comox Bay while drinking your morning coffee. This is west-coast living on Vancouver Island! Also, this home for sale features a two car garage with a modern, stylish garage door, additional parking in the driveway, and views of the Beaufort Mountains from the front of the house. One aspect of this home that truly stands out is the west coast style timber frame entrance accentuated by the beautiful stain glass front door. Come and take a tour of this contemporary and stylish rancher style home for sale in Courtenay. We are open for tours on Friday and Saturdays from 11am until 3pm. Coastal Custom Homes has a new custom home for sale. It is located at 4184 Remi Place, in south Courtenay at The Ridge. This rancher/bungalow style home is 1,620 sq. ft. and features three bedrooms with a vaulted ceiling in the great room. The bright and sunny kitchen is open to the great room, which features stunning views of Comox Bay and the local mountain ranges. It also includes a covered back deck and a two car garage. This home also features a west coast style timber frame entrance. Come and take a tour to see this custom designed home for sale.